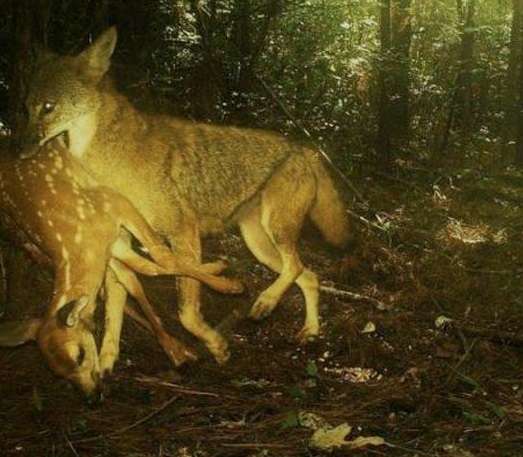 In many areas, coyotes kill a lot of deer, particularly fawns. Just how big is the impact? Some studies show coyote depredation is probably much more damaging than you think. Just about anyone who has hunted for long has seen a coyote enter a field and clear it of deer just by its presence. You may have noticed a deer fleeing through the woods with a coyote hot on its tail. These are all indicators that coyotes have an impact not only on deer populations but on deer hunting itself. But just how bad is it? In this first part of a two-part series I will look at some studies that have been done to illustrate how coyotes affect deer populations, and in part two, I will offer some advice about what you can do about it and how much affect your efforts are likely to have. Coyotes do kill adult deer, and they often kill healthy bucks and does. Coyotes hunt individually and in packs. When they are in packs is when they are the most lethal to adult deer, especially when other environmental conditions, such as deep snow, can be used to their advantage. In fact, a 2013 study of moose mortality in Ontario showed that coyotes were a significant predator on moose, which are four times the size of whitetails. But where coyotes do their most damage is during the fawning season. There is a myth that newborn fawns do not have an odor so predators cannot find them. Bears find them, bobcats find them and wolves find them. But coyotes are far and away the most lethal predator on whitetail fawns. There are many scientific studies to back this up. A study on an island off the coast of Maine determined that 74% of the fawns in one year were eaten by coyotes. A Texas study showed a 72% fawn mortality rate attributed to coyotes. A New Brunswick study showed 47% in one year and in more farming country, the numbers were lower but still significant; Iowa and Illinois studies showed mortality due to coyotes at over 51%. A study in the northern forest area of Minnesota showed that of all the fawn mortality that was recorded, 49% were killed by coyotes and 51% by wolves. Bear kills were not recorded because normally the remains, if there are any, of fawns eaten by bears are not found. So if you have any doubts that coyotes are putting the hurt on the deer population where you hunt, you can put those doubts to rest. Coyotes are killing your deer. In order to see if more fawns could be produced by keeping coyotes away, a large fence was erected at a research facility in Georgia. This 10-year study involved the construction of a fence around a 98-acre area that provided good fawning habitat for whitetails. The fence was four foot tall so coyotes could not get over it and buried in the ground far enough that the coyotes could not dig under it. GPS collars on the deer showed that the does quickly learned to go into this coyote exclusion area to avoid predation and have their fawns. This study showed two predictable results over ten years: Number one, the number of fawns that made it to reproductive age significantly increased. And Number two, hunting success also increased in and near the exclusion area. Not many of us could build a 4-foot high fence around our hunting land, so we must resort to other options. Killing coyotes is the most obvious, and it is effective if done over time and consistently, but there are drawbacks. Coyotes cover a lot of ground. Some of them have huge home ranges, dozens of square miles, and they are opportunists at finding areas with good game populations. You may trap or shoot every single coyote from your hunting property, but you will get your neighbor’s coyotes as they fill in the gaps. One Georgia study revealed some interesting results by removing coyotes on two wildlife management areas, one had a deer density of 55 deer per square mile and the other had a density of 22 deer per square mile. Professional trappers removed 15 coyotes from the larger and nine coyotes from the smaller one. Fawn survival increased at first but then leveled right off. How many coyotes do you need to take and for how long? A South Carolina study provides some insight. Hundreds of coyotes were killed on three separate 8,000-acre areas. Fawn survival went way up at first, but then began to decline over the four-year study. 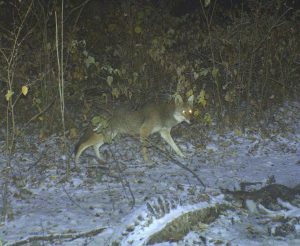 It seems the coyotes were finding the area fertile ground with little competition, and moving in about as fast as the trappers could catch them. This might seem like a hopeless situation, but really it’s not. You can have an impact even on small properties if you control coyotes to the best of your ability and keep them controlled as long as possible. Just stay after them and you will save some fawns, even if you cannot save them all. Get your neighbors involved and it will be even more effective for you. Fur prices on good quality coyote pelts are not bad right now, so the incentive to trap and shoot them during the winter is there, but control must be a year ‘round effort. In part two of this series I will offer some advice on getting started in coyote control through trapping, snaring and predator calling. Killing coyotes is not just good for deer, it’s good fun too and it’s another excuse to spend some time outdoors. explain some of your finding to Nebraska game Parks where they claim coyotes don’t impact wildlife numbers. I have studied many research papers on coyotes and the results are the same you want more der kill more coyotes. People just cant grasp that concept.